This is a Mod of the playermodel Ironsnout X10k's Riflerounds Hudgun. *Snout's "Hud Hands" use the default or other skin with the default filenames (snout_hands.png/dds) in the default directory- if you have different filenames (i.e. epicsuperawesomelookatmyl33tskillzhands.png) the hands will not be textured! 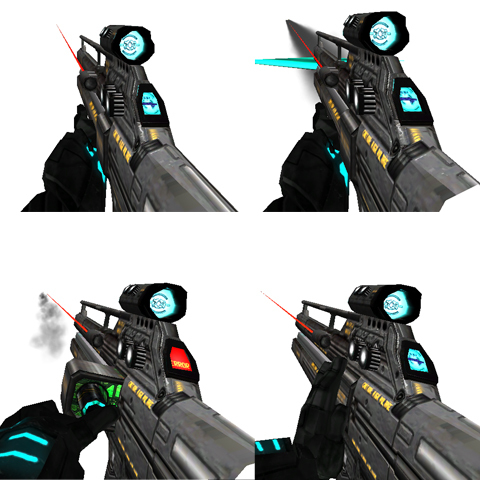 **If you don't like the laserpointer on the hudgun model, simply copy the files from the included "altskins" folder to the root directory to hide the laser. ***This railgun vwep model overrides the Rifle vwep for all playermodels- do not replace the vwep folder in the Sauer directory if you don't want this. I really like the style of the weapon; it feels more futuristic than the original, yet not too much. I'm not font of the muzzleflash which has been added once more. This should stay an option for the player to set on or off. The rifletrail doesn't feel correctly positioned anymore, so I guess there should be played a bit more with mdltrans and mdlyaw (settings mdlyaw -2 feels a bit better horizontally, yet still not vertically). You can see through the model once again, so perhaps trying to fix that with mdltrans would make it appear even better than it does now. There are still some traingles within the model fighting each other; as shown on the scope. If you stand still and look at the mount of the scope (the part after the display); it makes a weird change in it's shape. The barrel has the same issue actually (stretching out). So very nice looking gun! The animation and positioning still could use some tweaks though. It could also be that the rifle-trail is incorrect positioned due not having a tag called "muzzleflash" at the end of the barrel. I'm not really sure if Cube Engine 2 works like that (would make sense though). I noticed that model is little off (in my Sauer I can see backface of stock, and it's invisible...), so here's fixed .md3 file on this link. I also removed laser, and moved rifle little below, which is respecting license proveded with Pyccna's original model.